As any tenant of a multi-unit dwelling, any landlord, property manager, municipality and public or private sector waste hauler can tell you, multi-family recycling is hard. The curbside recycling programs that work so well in single-family homes just fail to deliver the same results in multi-family, so a new solution is needed. That new solution comes in the form of reusable recycling bags. 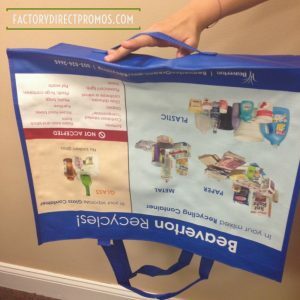 One of my favorite Factory Direct Promos team members, Beth Wilkerson our Operations Manager, recently outlined “5 Ways Reusable Recycling Bags Make Recycling Easy for Multi-Unit Tenants” for Waste Advantage Magazine. Find out what makes reusable recycling bags an effective recycling solution. For most multi-family tenants, space is tight. Many apartments, dorms or condos do not have garage space, and those that do may not be conveniently located. There often just isn’t room for the bulky recycling bins used to collect recyclables in single-family homes. The compact bag design of the reusable recycling bag provides a spot to collect items when necessary, while barely taking up any space. The recycling bags can be hung out of the way on a hook or doorknob. The simple design of these bags makes recycling easy. Tenants can easily fill their reusable recycling bag with bottles, cans and other recyclables, and when the bag is full, tenants can empty the contents into a community collection bin. A clever handle on the bottom exterior of the bag makes it easy to dump everything out of the bag into a larger bin. Dual handles enable easy carrying of the bag, or to even hang the bags in for ease of access. Reusable recycling bags are made from durable materials and feature a solid construction. The laminated fabric also contains any spills, to keep messes contained. These bags can easily be rinsed cleaned and left to air dry for simple maintenance. The ability to clean the bags makes it easier to store recyclables in the home without causing a mess. Reusable recycling bags can hang in there for dependable use in busy homes and will typically last for many years. These functional bags are often inexpensive, meaning they deliver an amazing return on investment. Everything about these reusable recycling bags can be customized. The design of the actual bag can be altered to improve the functionality and make it easy for tenants to use the bags. From altering the design of the handles or changing the size of the bags to anything else that will make it easy for tenants to use the bags and recycle. The material also accepts full-color printing on all sides, including the bottom, so you can include useful information about what materials can be recycled and direct tenants to the appropriate resources to answer any recycling-related questions they may have. The recycling bags serve as an incredibly powerful marketing tool as well by placing your branding directly in the hands of tenants. Check out the full post from Waste Advantage Magazine to learn more and find out how reusable recycling bags can simplify the process and increase recycling rates in multi-family dwellings. Beth also shares ordering tips to ensure you get the best deal possible and breaks down the cost-effectiveness of these reusable recycling bags. For an immediate quote on recycling bags, contact Beth directly at Factory Direct Promos.